A classic 3-hand pilot's watch with stealth aesthetics and modern mechanics. If you’ve seen the 1986 blockbuster Top Gun, you’re familiar with the Naval Fighter Weapons School for elite pilots, established in Southern California in 1969. 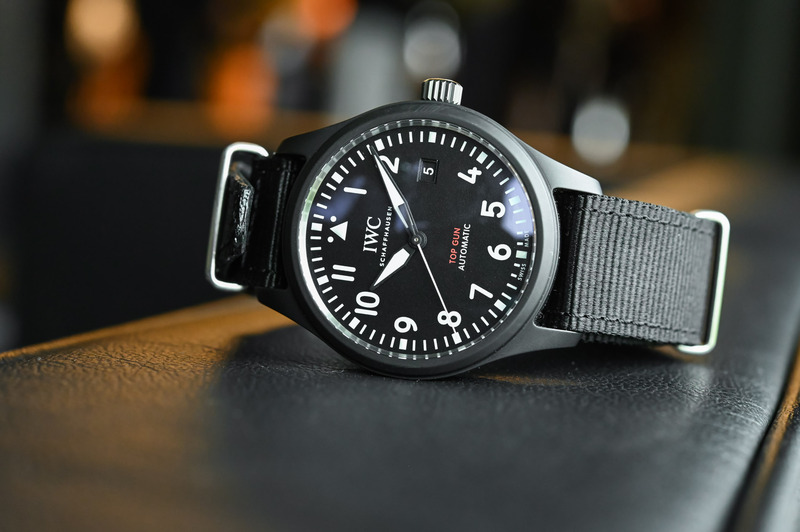 IWC has paid homage to Top Gun since 2007 and is releasing its latest three-hand automatic in the series with a new in-house movement and a matte black ceramic case. Launched simultaneously with the new Pilot’s Watch Automatic Spitfire, the TOP GUN model also shares the Spitfire’s IWC 32110 automatic calibre, although the case is 2mm larger than the 39mm Spitfire and has a more modern aesthetic. 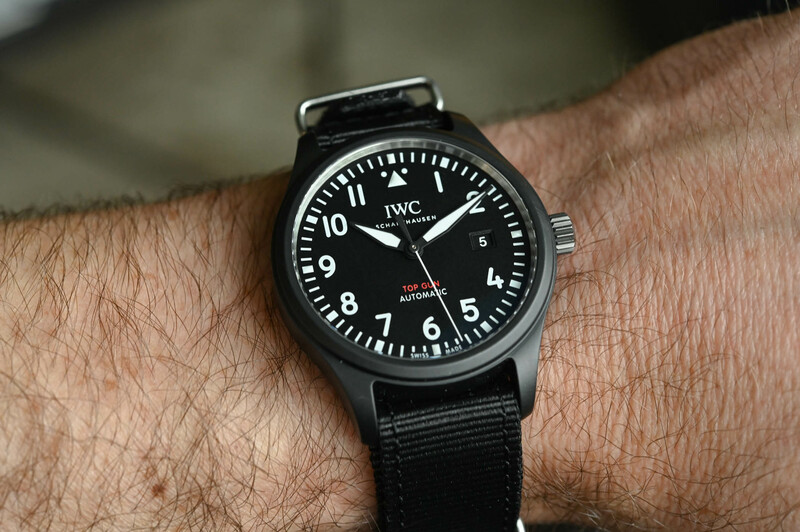 The dial is reminiscent of IWC’s Big Pilot’s watch series, and the black ceramic case is stealthy and contemporary. Built with pilots in mind, the matte finish prevents reflections and ceramic is more durable than steel, while the black dial with large Arabic numerals offers maximum legibility. It’s fair to say that the majority of buyers will never be ejected from a fighter jet, but the Pilot’s Watch Automatic TOP GUN is also at home in the driver’s seat of your favourite ride. 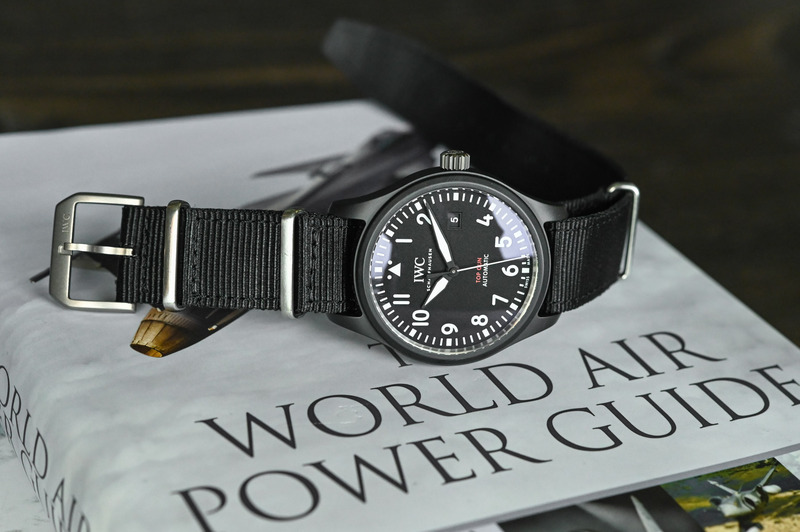 The case is slightly larger than the aforementioned Spitfire model (41mm vs 39mm) with a thicker height (11.4mm vs 10.8mm), but the design of the TOP GUN automatic is more in line with the IWC Big Pilot’s watch than the vintage-inspired Spitfire. The case comes only in matte black ceramic, while the Spitfire three-hand automatics have stainless steel and bronze variants. A second model, the Double Chronograph TOP GUN Ceratanium, is a split-seconds chronograph version for those looking for something more complex. 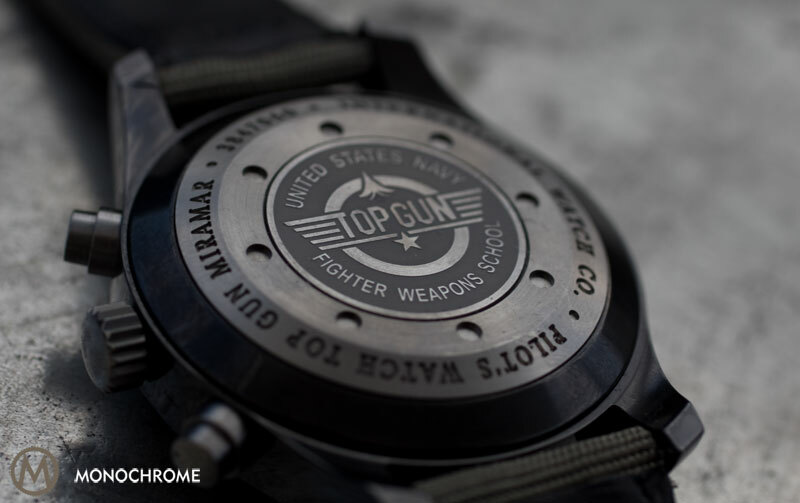 The caseback is titanium with the famous TOP GUN logo engraved in the centre. The crown screws down and allows the case to be water-resistant to 60 metres. The dial is protected by a domed sapphire crystal with anti-reflective coatings on both sides, which itself is protected against displacement from sudden drops in air pressure. The lugs are fitted with a rugged black textile strap. 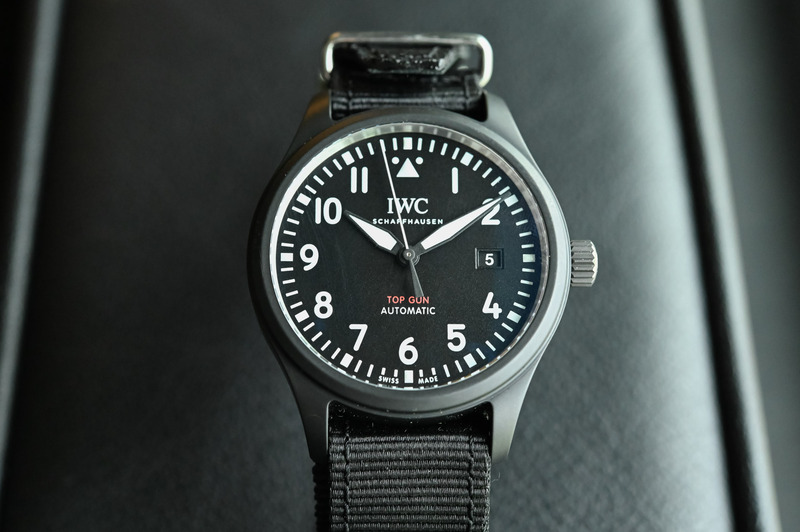 Looking closer at the dial, it has a simple pilot’s watch aesthetic that’s common throughout many of IWC’s Pilot’s Watch lines. Large white Arabic numerals surround the perimeter with a minute track spanning the dial’s edge (with five-minute marks). A bevelled date window sits at 3 o’clock with white numerals on a matching black background. 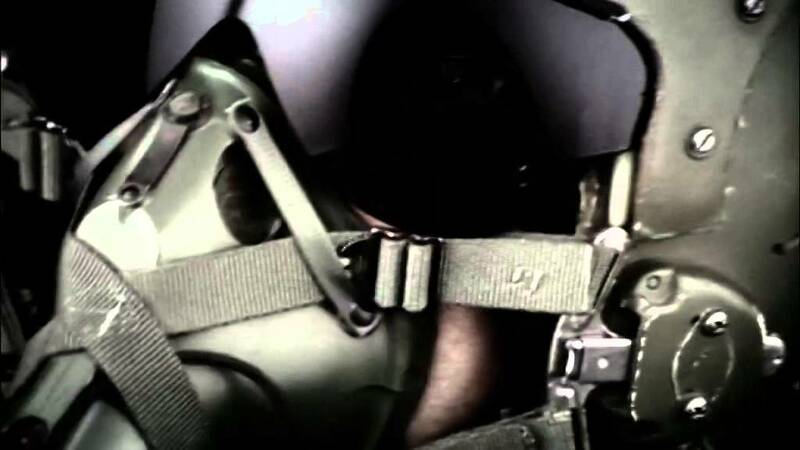 It’s simple, clean and highly legible, which is what a pilot needs in the hyper-fast environment of a fighter’s cockpit. The hands are black with plenty of white luminescence and have the same propeller shape as previous Pilot’s models. 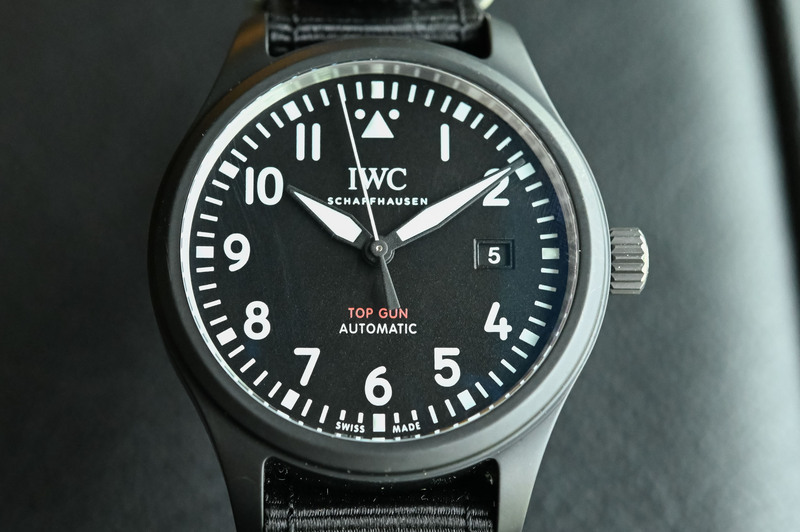 Moving on from Sellita, IWC is using an in-house 32110 calibre for its latest TOP GUN automatic. 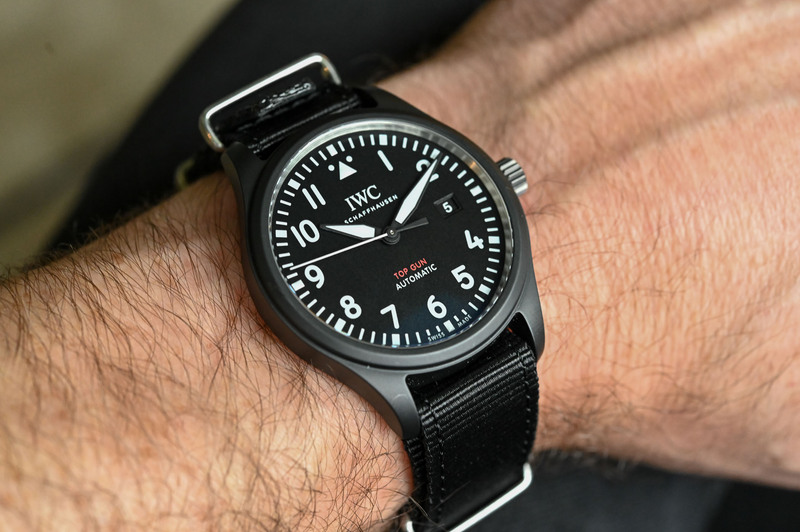 The movement is the same as the one used in the new Pilot’s Watch Automatic Spitfire, and it’s great to see entry-level models launching with IWC-manufactured calibres. 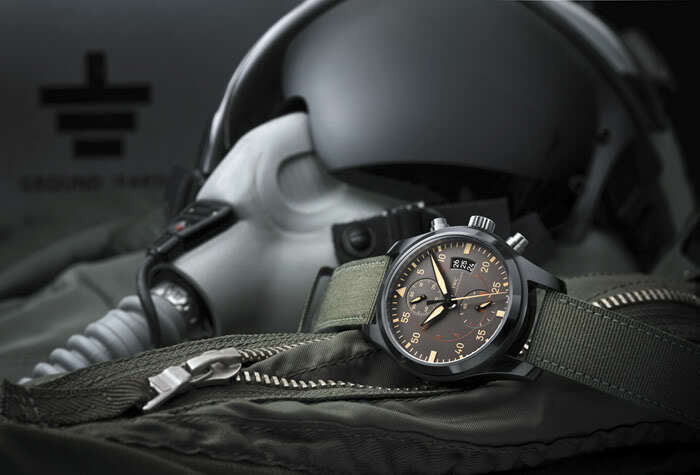 Its TOP GUN chronograph sibling also has an in-house calibre (IWC 69380). The 32110 has 21 jewels, beats at 28,800vph (4Hz) with a 72-hour power reserve. Functions include central hours, minutes and seconds (hacking) with a date complication at 3 o’clock. 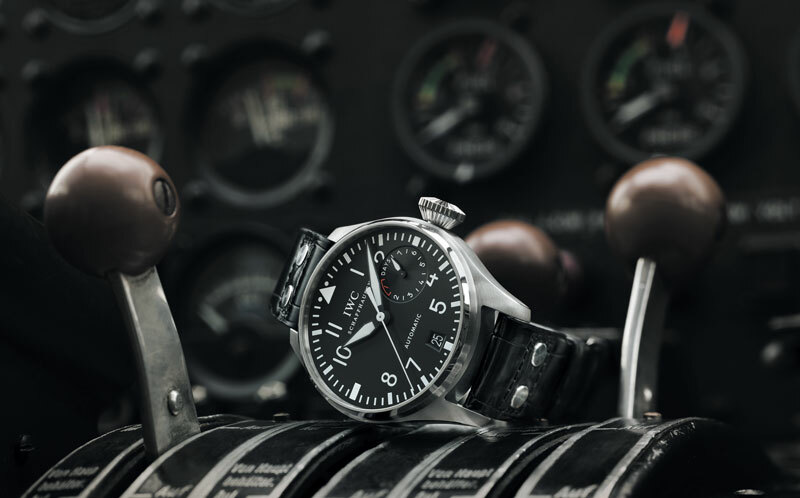 The Pilot’s Watch Automatic TOP GUN is another solid three-hand automatic in IWC’s latest squadron of pilot’s watches. 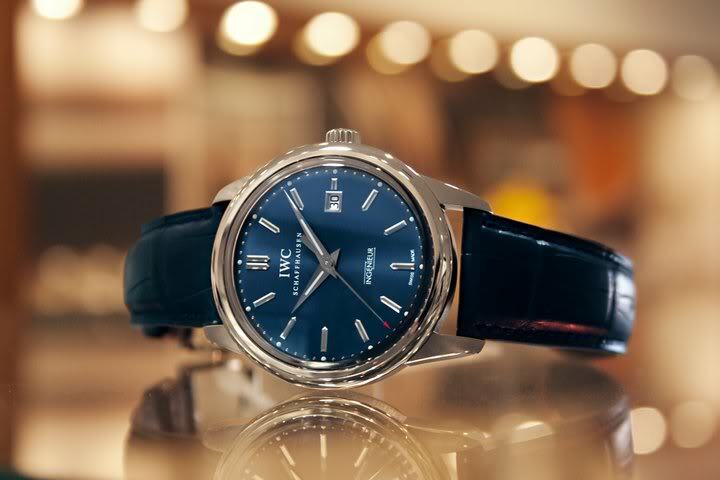 The new IWC 32110 is a welcome replacement for Sellitta calibres as the brand steps up its game in the entry-level segment. Price will be EUR 6,250. More details at iwc.com.